We are standing alone in the field, a sky unable to rain. She is explaining to me how the eagle on the end of her bare arm is isolated to molt in an aviary for several weeks of the year. A large camera is pressed firmly against my chest as the bird looks away indifferently, turning its head to study everything on the clear cut lawn and the farmland beyond. I recompose to place the bend of its shoulder into the centre of the frame. Adjusting to accommodate for its movements that punctuate a rhythmic refolding of wings I cannot anticipate. Pausing to draw my focus from the viewfinder, she tells me that cloaked in isolation their characteristics change, tending away from what is learnt, their behaviour begins to regress by unbinding the line that designated their actions. I assume that the eagle won’t remember her, mentioning something I once read about the nature of goshawks, but I hear unconvincingly that they usually do. The bird will lose its precision in the absence of the falconer, successively marking out that territorial line around the limits of their character. Made through positive reinforcement, she emphasises, shifting her weight slowly to the opposite leg with her arm locked still. Yet given enough repetition by the falconer, the bird will learn these movements, manipulating the routine that was constructing the limit of its actions. The bird mantled on the clasped glove is observing something past the falconer’s head. Thickets surrounding groups of tree, furrows meeting the sky. It seems to be gaining mass with my persistent questions, I can’t comprehend its weight, carrying a camera of metal and glass, feathers don’t seem to constitute matter. Turning back up the path towards the eagle’s enclosure, with the bird now between us, she tells me that being solitary creatures they fail to understand hierarchical dominance, meaning that the conditioning of a bird relies on a huge number of variables. 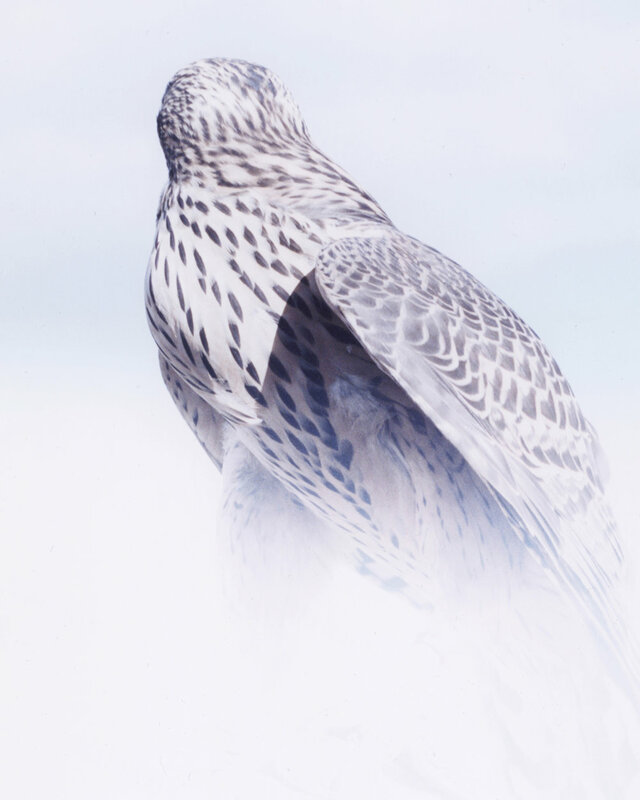 Still, it is said by some that by pushing against the resistance of the falcon, that the man and bird can exchange characteristics, unfolding into one another. As I pack the camera into a bag, the roles of recognition and misrecognition are now undefined, as these images will become a way of measuring oneself against another figure, even if the subject has turned to retreat they will never come into alignment. Perhaps this is how distance must look, outside of the clarity that the eagle sees, it is an indifferent scale, unfixed but ripe for judgement. In the cage I see human footprints punctuating the sand, raked into lines and beaten blunt by absent wings. So as bird and trainer step into the tapering dark of the aviary, her voice has drawn a circle, a divide between bird and me, a cascade of wing feathers tightening into her body. Cameron Williamson is an artist working with text, image and video based in the UK and Switzerland. Recently he has been working with the role of the individual in an alpine landscape, enquiring after notions of a body shedding space through ritualistic visual practices. This forms an ongoing critical interest in the human figure as a body reliant on orientation and recognition. Notes on features contemporary photography accompanied by creative writing.